The highly anticipated, thrilling sequel to the New York Times bestseller, Strange the Dreamer, from National Book Award finalist Laini Taylor, author of the bestselling Daughter of Smoke & Bone trilogy. Sarai has lived and breathed nightmares since she was six years old. She believed she knew every horror, and was beyond surprise. In the wake of tragedy, neither Lazlo nor Sarai are who they were before. One a god, the other a ghost, they struggle to grasp the new boundaries of their selves as dark-minded Minya holds them hostage, intent on vengeance against Weep. Lazlo faces an unthinkable choice--save the woman he loves, or everyone else?--while Sarai feels more helpless than ever. But is she? Sometimes, only the direst need can teach us our own depths, and Sarai, the muse of nightmares, has not yet discovered what she's capable of. As humans and godspawn reel in the aftermath of the citadel's near fall, a new foe shatters their fragile hopes, and the mysteries of the Mesarthim are resurrected: Where did the gods come from, and why? What was done with thousands of children born in the citadel nursery? And most important of all, as forgotten doors are opened and new worlds revealed: Must heroes always slay monsters, or is it possible to save them instead? 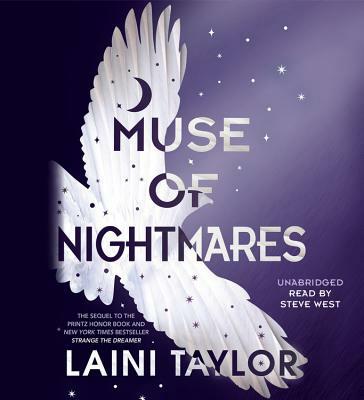 Laini Taylor is the New York Times bestselling author of the Printz Honor Book Strange the Dreamer and its sequel, Muse of Nightmares. Taylor is also the author of the global sensation the Daughter of Smoke & Bone trilogy and the companion novella Night of Cake & Puppets. Taylor's other works include the Dreamdark books: Blackbringer and Silksinger, and the National Book Award finalist Lips Touch: Three Times. She lives in Portland, Oregon, with her husband, illustrator Jim Di Bartolo, and their daughter, Clementine. Her website is lainitaylor.com.